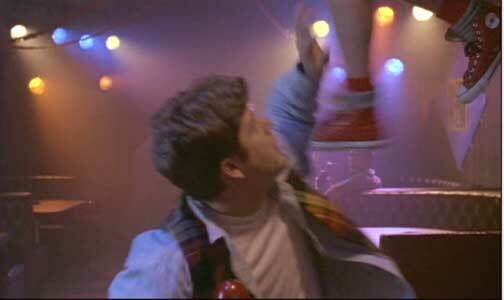 Brendan Frasier wears black, black checkered, and red high top Converse “Chuck Taylor” All Stars in the film. Link makes a big impression at Encino High when he double-flips off a staircase to check out some girls. Dave Morgan (Sean Astin) and Stoney Brown (Pauly Shore) are two losers at Encino High trying to do something to make an impression on the other students, especially the girls, so that they can score dates to the senior prom. Dave’s answer is to excavate his back yard so that a new swimming pool can be installed, and he can host a cool graduation party. No one really believes that this will work, especially his little sister Teena (Ellen Blain). But Dave persists, and one afternoon while he is digging he unearths a prehistoric pottery bowl. Then an earthquake hits and when Dave and Stoney return to the backyard, they discover that a glacier chunk has beem uncovered with some sort of fossil inside. They dig it up and leave it in the garage with two portable heaters on while they go to school. 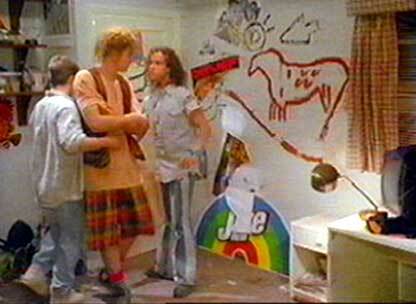 When they return they find muddy footprints in the house and a pre-historic caveman (Brendan Fraser) in Dave’s room. After they first make contact with the caveman, and gain his trust and attention (by showing him a butane lighter) they clean him up, dress him up in current clothes, and start to communicate with him, giving him the name Link (for “missing link”). Dave and Stoney quickly discover that Link is very intelligent and a quick learner, so they teach him the local lingo, and decide to pass him off as a foreign exchange student at school. Link shows some fancy steps to some homeboys in the hallway. Link is a big hit at the high school. With his direct and uninhibited caveman approach to life, Link impresses the student body with his crazy dance steps and enthusiasm for all of the new things that he is learning. The “in crowd” girls find him irresistable also, which draws the ire of some of the jocks on campus, led by Matt (Michael DeLuise) who has made a career of humiliating Dave at school. When Matt’s girl friend (Megan Ward) falls for Link, he takes on Link, and tries to discredit him as the big prom night approaches. Dave and Stoney clean up Link and transform him into a valley dude. 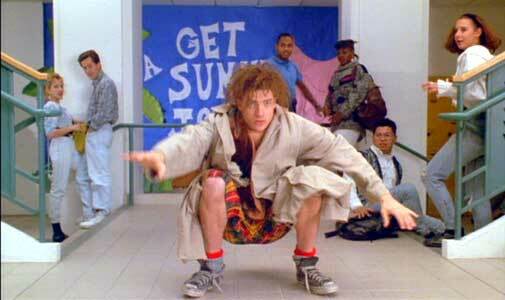 Since the storyline uses the familiar themes of “in” versus “out” crowd at a high school and how someone raised with no contact at all with modern civilization acts when suddenly placed in it, the primary interest for viewers of Encino Man has to be the satire that you get from seeing how well-accepted an actual caveman could be in today’s teen society. Since much of today’s teen lingo and life style already seems foreign to others, it’s funny to see a caveman respond to their music for the first time, play video games, learn things by watching television, discover the pleasures of fast food, and use computer graphics to create cave wall paintings. And teen partying? Who could be better than an actual caveman? The main thing that makes Encino Man fun to watch is the exuberant performance by Brendan Fraser in his role as the prehistoric caveman, Link. While Encino Man was supposed to be a film-launching vehicle for MTV host Pauly Shore, it actually served that purpose for Brendan Fraser, in his first full length motion picture with a leading role. In a way you almost feel sorry for Sean Astin as the plodding Dave and Pauly Shore as his spaced-out, wise-cracking best friend. Cast as the losers trying to make an impression by their great find, they find themselves career-wise and plot-wise at the same place at the end, while Fraser’s performance gave him a lot of credibility for his later casting in George of the Jungle. Besides all of the slapstick and fancy dance steps, Fraser also puts in one poignant moment, when their school science class take a field trip to the natural history museum, and Link wanders off to see an exhibit devoted to the prehistoric era from which he came. Imagine the reaction you would have if suddenly you found your past life encased in a glass display. 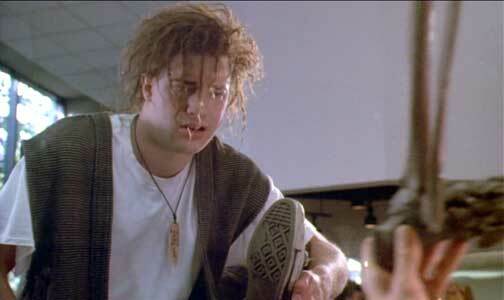 So watch Encino Man if you want a pleasant diversion that pokes fun at today’s teenage society. Director Les Mayfield keeps the pace fairly quick and at 88 minutes just the right length. 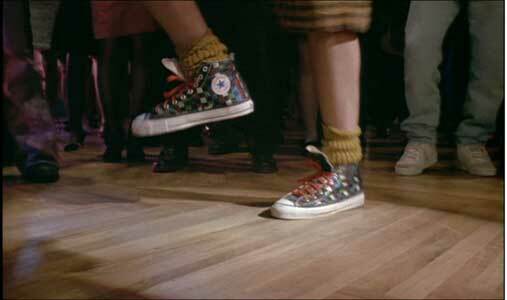 The partying sequences are also helped by some good tracks by Queen, Tone-Loc, Infectious Grooves, and Vince Neil. Link falls back on the bed when Dave starts to communicate with him. Link compares his foot to that of the prehistoric fossil being restored at the museum. 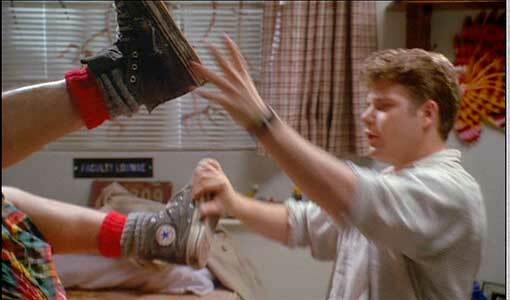 Encino Man is filled with a lot of good chucks shots. Decked out in his valley dude outfit of loose t-shirt, open vest, plaid shorts, grey thermal socks with a red top stripe, and worn black chuck high tops, caveman Link fits right into the local scene and the camera work picks this up all through the film. There is also a sequence where Link wears red high tops. But the best sequence is saved for the prom, where Link wears a new pair of black patterned high tops with red laces, as he leads the crowd of party-goers in a wild dance sequence. 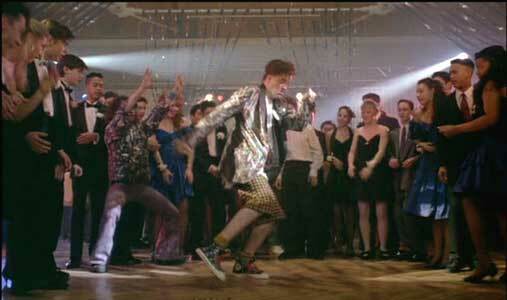 Link leads the prom in a wild dance. Closeup of Link’s fancy footwork at the prom. Link tumbles down the hall. Dave tries to break Link’s fall as he swings around the inside of a bar. Encino Man. (1992) Sean Astin, Brendan Frasier, Pauly Shore, Megan Ward, Robin Tunney, Michael DeLuise, Ellen Blain, Mariette Hartley, Richard Masur. Directed by Les Mayfield. Categories: Comedy, Romance, Teenagers.